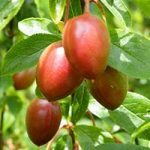 These are small trees yellow or red plum-sized fruits which are edible, sweet and juicy; they may hang on the tree until October. Good in hedges and windbreaks. Also an early source of nectar and pollen for honey & bumble bees. Bare root maidens or two year trees on St Julien A or Pixy rootstocks.